Whether you are a pro or a beginning golfer, Punta Mita offers a unique golf experience that you will truly enjoy. Punta Mita proudly features 36 holes of Jack Nicklaus Signature golf. Set on 380 acres of peninsula bordered by both the Pacific Ocean and beautiful Banderas Bay, golf in Punta Mita is truly a spectacular setting. The private Punta Mita Golf Club is open exclusively to Club Punta Mita Members and their guests, and guests of the Four Seasons and St. Regis resorts. Members enjoy access to the comfortably appointed clubhouse, which offers dining, bag storage, and other amenities. This is the place to meet your friends—and play. Panoramic views make a camera a must as you play world class golf on either of Punta Mita’s par 72 Championship courses. Both the Pacifico and Bahia courses offer a wide-range of tee boxes, for players of all skill levels. The Pro Shop at the Punta Mita Golf Club offers all you need to play your game in style and comfort. From a variety of golf balls and clubs to golf accessories and clothing, you’ll find something to tempt you. Mens’ and Ladies’ golf attire features the latest styles from Nike, Ralph Lauren, and other top brands. The Pro Shop also features an extensive line of Punta Mita Logo items and attire. All is geared for the climate and relaxed atmosphere of Punta Mita. Named after our signature island green, Tail of the Whale is a casual restaurant located on the upper level of the golf clubhouse and features amazing views of both the Pacific Ocean and our two Jack Nicklaus Golf Courses. This restaurant offers an international menú, delicious breakfast for early golfers and exquisite dishes to enjoy a lovely lunch. Complimentary coffee: 07:30 a.m. – 10:00 a.m.
Breakfast: 08:00 a.m. – 11:30 a.m. Lunch: 11:30 a.m. – 05:00 p.m.
Bar service: 10:00 a.m. – 07:00 p.m.
· Complimentary coffee is served from 7:30 a.m. – 10:00 a.m.
· Beverage cart service is available from 7:30 a.m. – 5:00 p.m.
Punta Mita Golf Club enforces a dress code appropriate to the traditions of the game. Men: Collared shirts or sleeved mock shirts must be worn at all times. 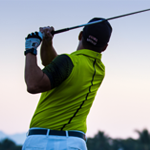 No cut-offs, swimwear, gym shorts or denim is allowed on the golf course or practice facility. Women: No tank tops, cut-offs, swimwear, gym shorts or denim is allowed on the golf course or practice facility. We offer men and women’s TaylorMade Burner Superlaunch Irons & TaylorMade Burner Superfast Drivers & Woods. Foot Joy rental shoes are available in men’s and women’s styles. · Our professional staff with years of teaching experience provide lessons at Punta Mita Golf Club. · Individual, group or playing lessons available. · Complementary tours are offered daily at 3:00 p.m. to 4:00 p.m., please sign up through Proshop. Golf lessons are priced for 1 to 2 players. An additional $30.00 USD per hour, per person. Rentals included (balls not included). One player at least 16 years old to drive the cart, unless the lesson is walking. Golf clinics are provided on Tuesday and Thursdays from 10:00 a.m. to 11:00 a.m., the cost is $40.00 USD per golfer.